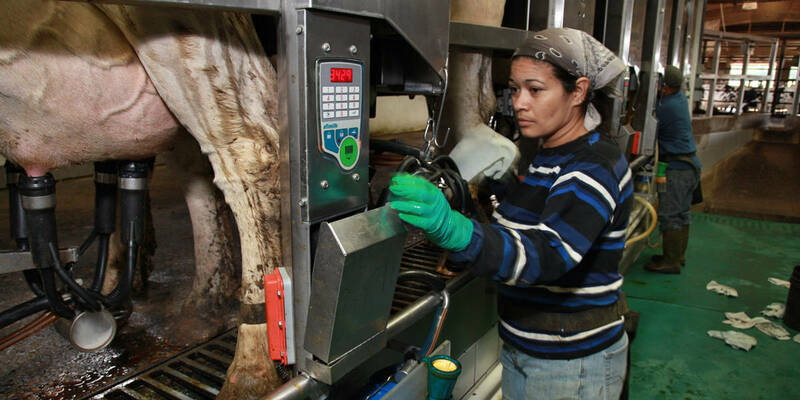 Immigrant workers make up nearly half of the dairy labor force and dairies employing immigrants produce 79% of the US milk supply. However, most workers receive no safety training. Producers and workers struggle with language and cultural barriers and limited safety resources. This changing diversity in the workforce presents new occupational risk factors. Culturally and linguistically appropriate education in agricultural health and safety is necessary. Producers and immigrant workers successfully tested a model program to address on-the-farm safety needs from hazard reduction to worker training. It developed a train-the-trainer curriculum that was later adopted by OSHA as an approved curriculum and utilizes Community Health Workers. The 5-module curriculum includes background sections, step-by-step facilitator guides and handouts to reinforce safety messages, as well as visuals for workers with limited formal education and low literacy levels.